Be more sappy, why don’t you! If you haven’t already grasped, I do enjoy playing Warcraft. Sometimes I don’t as much as other times, if we’re doing full disclosure. I’ve been moved on several occasions to give it up altogether, but something always pulls me back. What remains intractable is the learning experience I’ve gained not simply from playing the game, but from interacting with the other people who do with and around me. Although I am often deliberately solo in my play-style, there is no avoiding the rest of the population. Often, if you want to achieve the awesome, that’s an inevitable part of the deal. One of my favourite phrases when considering such things is that ‘every day is a school day.’ You can learn anywhere, if your mind is open to the understanding that knowledge doesn’t simply come from a book or from a teacher. This game is a journey that has become a part of my life. It isn’t just because I’ve been writing about it for four years. I realise that I could do that with anything, if I’m passionate enough about it, and there are many other subjects I could attack in Blog form. It isn’t because of the friends I have made either, of which there are many, scattered across the globe. It is a basic understanding that what I learn in game about myself: how I attack problems, how I deal with other people, how I process has a direct link to how the real world is both perceived and dealt with. Playing this game has made me realise the bad things about myself far more acutely, the vices and obsessions, the desire to not try and be carried by others, until the understanding becomes clear that effort is its own reward, and choice is king. Most importantly of all, from a writers perspective, the game has helped me to understand the value of consequences. Everything you do in game has a massive number of potential causal effects, not simply on in-game events. Being able to understand how these relate to both you and your environment and the consequences of said events, opens up the mind to millions of potential outcomes, enough sometimes to make your head spin. As a writer this is my meat and drink, the stuff of legends, the untappable wellspring of ideas and enthusiasm and inspiration. When my first novel makes it to a readable, published form (and it will, oh yes), there will be those who can rightly cite this game as a significant influence in what I’ve written, because it undoubtedly is. It has warped itself into my being, and anyone who understands my history will know that it has a place in a far wider context. The fact remains that, after eight years, I’m still not ashamed to stand up and be counted as a fangirl, because I appreciate the value of passion. That’s a lot of people, that is. On the back of the announcement that ONLY 7.7 million people are playing the game, being retweeted to over a quarter of a million of them in one hit yesterday is a huge moment for me. It is a snapshot of the moment we find ourselves in, where being able to write in 140 characters with the same passion I use in long-form is enough to make my feelings stand out. I consider Twitter as a life-skill I need to learn, because to make people want to read more than four lines of text is hard work in the modern world. If I can draw people in with the real desire I can show in that medium, then maybe there is a chance that more people will take the time to consider a bigger picture, where words for me are as important as the character I play and what I do. Without this game, I would not be the person that I am. All over the world there are those who share that same passion, and have been touched by the same events that I have. 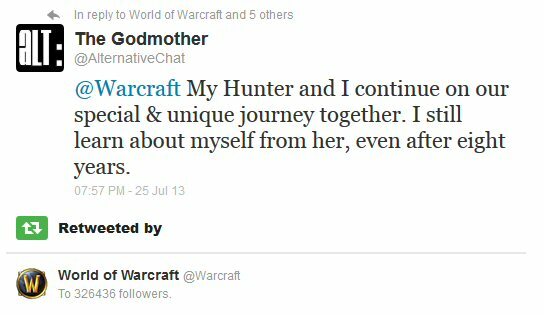 I am proud to be a part of this, and whatever may happen from this point on I will always consider my time in Warcraft as some of the happiest I’ve ever had as a gamer. For what it's worth, I don't read Twitter and I find a ton of value in long-form writing. We may be a slowly dying breed but we aren't gone yet.